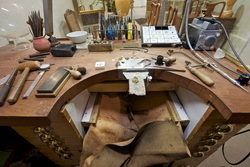 Jewellery Repair Workshop offering outstanding Service and Historic Experience for almost 145 years. The Home of Jewellery Repair and Restoration Since 1875. Our Jewelry Repairs Workshop provide a nationwide jewellery repair service, ring resizing ring repair service, jewellery polishing and cleaning for London & the UK - England, Wales, Scotland, Northern Ireland, Eire, Europe & Worldwide.. Please visit our Office and Jewellery Workshop in the historic cobbled Bleeding Heart Yard. Our in-house historic London jewellery repairs workshop has been located in Hatton Garden London since the 1920's, previously in Birmingham and Clerkenwell from 1875. Our Jewellery Repair Workshop London for Repairing jewellery, mending jewellery, restoring vintage rings, repairing antique jewelry, restoring jewellery, restoring antique jewels, servicing jewellery and fixing old jewellery. Soldering gold repairs. Siilver soldering and platinum soldering repair. First Class London Ring Sizing and Ring resizing London and ring alterations too. We can restore and fix a worn ring and antique ring repair. Our London goldsmiths repair antique jewellery and preloved jewellery. Setting the standard since 1875 our Hatton Garden diamond polisher can repair damaged diamonds or a have chipped diamond repaired, our lapidary will repolish chipped gemstones. 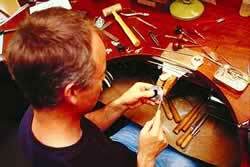 Jewellery Repairs Hatton Garden London and Jewellery Resoration Services London. Hatton Garden Jewellery Repair Centre. Antique Jewellery Repairs London. As London wholesale jewellery repairers, we embrace many types of jewellery repairs & jewellery alteration, jewelry restoration and custom jewellery design work. Speedy ring sizing service, ring re-sizing service and diamond remounting in our London jewellery workshop and London's jewellery repair centre. We specialize in remounting diamonds and precious gemstones into a new ring mount & mountings, pendants, earrings & necklaces. We offer a unique bespoke jewellery repair service. Laser repairs Jewellery Laser Repairing London. Our efficient repair department is staffed with expert Goldsmiths who will evaluate the work that needs to be completed and explain the entire process. No jewelry repair job is too big or too small. Our skilled jewellers are eager to take on any challenge that your jewellery needs may present. 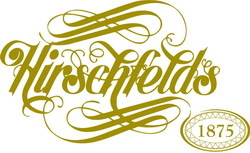 You and your jewellery are most important, so please allow us be of service to you. Our goldsmiths repairs are really outstanding! Londres reparación de joyería. Réparation de bijoux London. Schmuckreparatur London. Naprawy biżuterii London. Riparazione di gioielli London. ювелирные изделия ремонт Лондон. ювелірні вироби ремонт Лондон. Ремонт на бижута в Лондон. 珠寶修理倫敦. Sieraden reparatie Londen. Reparatii bijuterii Londra. Jocalia instaurabo London.